In contrast to percutaneous atrial septal occluder device, surgical patch closure of atrial defects was known to be no infective endocarditis risk. We herein report the first case of late endocarditis of surgical patch closure of atrial septal defects occurred at 47-year after surgery. On September 2014, a 56-year-old immunocompetent French Caucasian man was admitted into the Emergency Department for 3-week history of headache, acute decrease of psychomotor performance and fever at 40 °C. 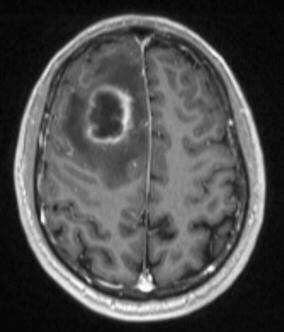 The diagnosis has been evoked during his admission for the management of a brain abscess and confirmed using 18F-fluorodeoxyglucose gated cardiac computed tomography (18F-FDG-PET/CT). Bacterial cultures of surgical deep samples of brain abscess were positive for Streptococcus intermedius and Aggregatibacter aphrophilus as identified by the matrix-assisted laser desorption/ionization-time of flight (MALDI-TOF) mass spectrometry and confirmed with 16S rRNA gene sequencing. The patient was treated by antibiotics for 8 weeks and surgical patch closure removal. In summary, late endocarditis on surgical patch and on percutaneous atrial septal occluder device of atrial septal defects is rare. Cardiac imaging by the 18F-fluorodeoxyglucose gated cardiac computed tomography (18F-FDG-PET/CT) could improve the diagnosis and care endocarditis on surgical patch closure of atrial septal defects while transthoracic and transesophageal echocardiography remained difficult to interpret. Infectious complication of atrial septal occlude device is rare that represented about 0.1 % of cases . We herein report the first case of endocarditis at 47-year after surgical closure of atrial septal defects discovered by positron emission tomography with 18F-fluorodeoxyglucose gated cardiac computed tomography (18F-FDG-PET/CT). On September 2014, a 56-year-old immunocompetent French Caucasian man was admitted into the Emergency Department for 3-week history of headache, acute decrease of psychomotor performance and fever at 40 °C. In his medical past-history, he underwent a surgical patch closure of atrial septal defects for patent foramen ovale at 9 years old and dental care at 5 months before his admission. Laboratory investigations revealed an elevated leukocyte count at 12.6 × 109/L with an elevated neutrophil count at 8.4 × 109/L, a normal platelet count at 180 × 109/L, an elevated C reactive protein rate at 97 mg/L and negative blood culture. A brain magnetic resonance imaging (MRI) revealed a right occipital cerebral abscess (27 × 36 × 43 mm, hyper intense T2) (Fig. 1). He underwent surgical brain abscess drainage. Bacterial cultures of surgical deep samples of brain abscess were positive for Streptococcus intermedius and Aggregatibacter aphrophilus as identified by the matrix-assisted laser desorption/ionization-time of flight (MALDI-TOF) mass spectrometry and confirmed with molecular identification (16 s gene sequencing). The patient was treated first with an empiric antibiotherapy with cefotaxim 4 g every 8 h associated with metronidazole 500 mg every 8 h and cotrimoxazole 800/160 mg every 8 h. One week later, the antibiotic treatment was modified for ceftriaxone 2 g/day associated with metronidazole 500 mg every 8 h and rifampicin 300 mg every 8 h.
A transthoracic echocardiographic examination and a body scan revealed no abnormality. A transesophageal echocardiography showed a high right left shunt suggestive of atrial septal patch dehiscence without direct sign of. An 18F-FDG-PET/CT showed an intense linear hypermetabolism opposite the interauricular septum compatible with an endocarditis on the intracardiac device (Fig. 2). Transesophageal echocardiography after 6 weeks of antibiotic treatment showed a filamentous image opposite the mitral valve and no vegetation image was found. A second 18F-FDG-PET/CT kept showing hypermetabolism on the surgical patch closure of atrial septal defects. The patient was treated by antibiotics for 8 weeks. At the end of antibiotic treatment transthoracic echocardiographic examination showed an exclusive right left shunt, confirming dehiscence of the surgical patch closure of atrial septal defects. Surgical removal of surgical patch closure of atrial septal defects was necessary on April 2015 with replacement by a bovine pericardial patch. No antibiotics were given during explantation. Explanted atrial surgical patch closure of atrial septal defects looked swollen and calcified with negative bacterial cultures. The patient recovered without further complication. His hemiparesis fully disappeared; he only kept discrete amnesic and attentional failures. He presents a sequelae of attentional and memory deficits at 1 year of follow-up. In contrast to percutaneous atrial septal occluder device, surgical patch closure of atrial septal defects was known to be associated with no infective endocarditis risk . To our best knowledge, only one case of endocarditis on surgical patch of ventricular septal defect  and 17 cases of bacterial endocarditis on percutaneous atrial septal occluder device [4–15] have been reported. In our case, the late onset of the infection occurred at 47-year after surgery, and it suggests that origin of endocarditis of surgical patch closure of atrial septal defects was a hematogenous spread of bacteria during the dental care at 5 months before. Diagnosis of endocarditis on atrial septal occluder device is generally done by transthoracic echocardiographic or transesophageal echocardiography. Therefore, in our case the diagnosis has been evoked during his admission for the management of a brain abscess, and established using 18F-FDG-PET/CT while transthoracic and transesophageal echocardiography remained difficult to interpret. The benefit of 18F-FDG-PET/CT has been demonstrated in the diagnosis of prosthetic valve endocarditis cardiac device-related endocarditis for detect infection by highlighting inflammatory leukocytes express a high density of glucose transporters and are highly metabolically active with the high spatial resolution of cardiac tomography and angiography, and it was recently added to the diagnosis of infective endocarditis criteria [16, 17]. In summary, late endocarditis on surgical patch and on percutaneous atrial septal occluder device of atrial septal defects is rare. We believe that the contribution of 18F-FDG-PET/CT could improve the diagnosis and care of endocarditis on surgical patch closure or percutaneous atrial septal occluder device of atrial septal defects. A prolonged antibiotherapy and surgical management with surgical patch removal is a major therapeutic option of endocarditis on surgical patch closure of atrial septal defects. EH involved in clinical data collection and the drafting of the manuscript. PS involved in the drafting of the manuscript and manuscript revision. AR provided clinical data verification and revision of the manuscript. GH provided clinical data verification and revision of the manuscript. AS provided clinical data verification, corrected the discussion section, and approved the final version to be published. All authors read and approved the final manuscript. The authors thank Catherine Peruffo for her assistance in acquisition of data. The authors obtained permission from Catherine Peruffo to acknowledge. This study was approved by the institutional research ethics board (Comite de Protection des Personnes Sud Méditerranée 1), and written informed consent was obtained from the patient to participate to this case report and any accompanying images. The authors have no relevant affiliations or involvement with any organization or entity with a financial interest or conflict with the subject matter or materials discussed in the manuscript. No writing assistance was utilized in the production of this manuscript.